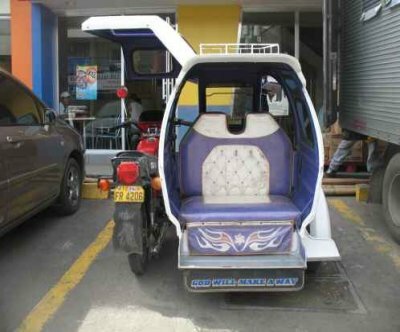 Tricycle, Motorela and Habal-Habal have two things in common: They are built around a motorbike and they are the most compact public transportation vehicles. 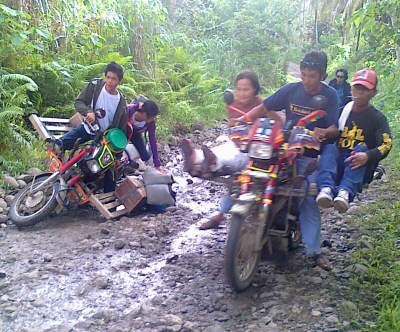 Habal-Habal is simply a motorbike with driver for rent. Tricycles are motorbikes with a sidecar and motorelas are motorbikes with an integrated trailer. A first big progress had been the replacement of the smoking 2 stroke engines by 4 stroke ones. A new revolution is now coming: The introduction of e-trikes, tricycles with electric motors. Climate is hot in the Philippines, so people do not like walking. For a few pesos they can ride on a tricycle for just a few hundred meters. If you aren't to tall, try it, it's fun. Inside cities, tricycles and motorelas usually aren't allowed on transit roads. These vehicles are clogging any street or road with their low average speed of less than 20km/h. On national highways they are a real pain for the car drivers. 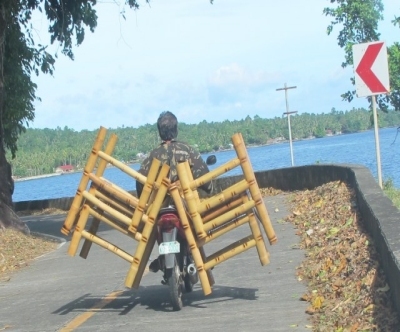 You get completely nuts when an overloaded wood truck follows a tricycle over many kilometers. You can't safely overtake. The Tricycle is the Philippine rickshaw. A motorbike or sometimes a bicycle with an attached sidecar. If it is a bicycle, then it is called a pedicab! They are decorated like the jeepneys and gadgets are attached here and there. There are various styles of tricycles. Each region has its own type. 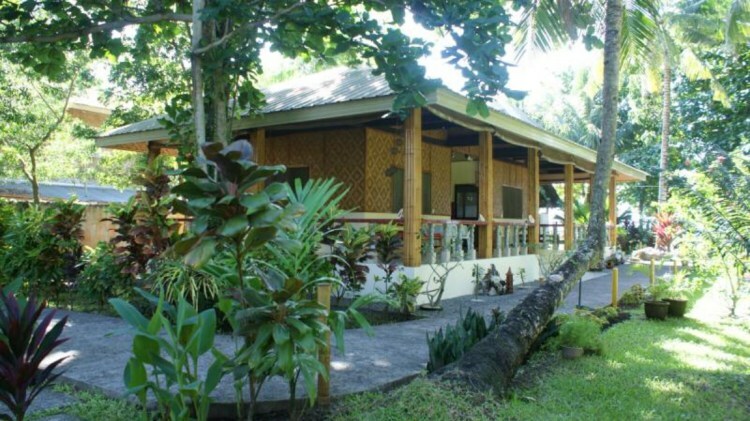 On Panay Island there are two types: the Aklano type with 2 facing benches in the rear and 1 bench in front. They offer officially 9 passenger places. The Iloilo type has two benches back to back and a small seat in front. They also transport up to 9 people. 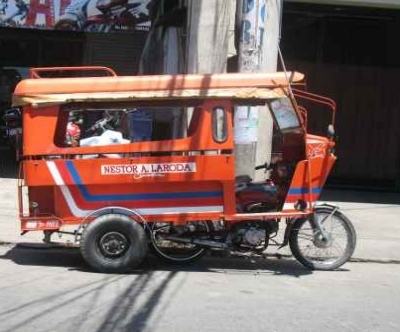 The smallest tricycles can be found in Naga City. It is impossible that two normally built caucasians can ride together. Somehow different is the Motorela of Mindanao, Camiguin and parts of Bohol. The passenger room is built around the motorbike and has two facing benches and a seat on each side of the driver. 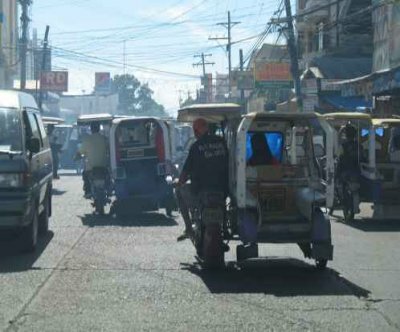 Tricycles are fine for in-town rides or the short distance from bus terminals to your downtown hotel. The fares are fixed by the government and should be displayed in the tricycle. The standard fare is 2 pesos to start and then 1 peso every 300 meters. These fares apply when you tell the driver, that he may pick up other passengers. If you forget to do so, he drives you directly to your destination and you have to pay 9 times the price of one fare, because you hired the tricycle exclusively. Usually count PHP 10 for any ride inside the town center. If you are a group, you may consider to hire a tricycle for a day to do sight-seeing. The driver then puts a sign on his windshield saying:"Family use" and you won't be stopped by other travelers. 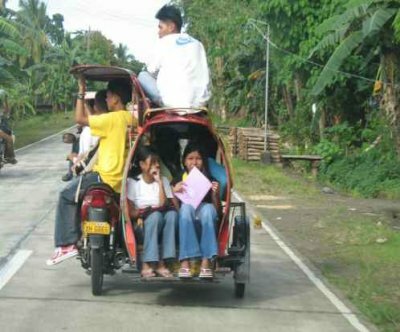 A tricycle costs PHP 100 to 200 per hour. Tricycles are rather safe. They do not drive very fast and when there is a collision, it is not too serious. But beware, when you are seated in the back, protect your head with your hands. When there is a hole in the road or the concrete road turns into mud, the tricycle will bounce and your head bangs against the roof. We recommend not to take tricycles at night on country roads. Usually their lights do not work and when there is a jeepney crossing, usually also without light, the collision may be deadly. An Aklan tricycle in Kalibo. 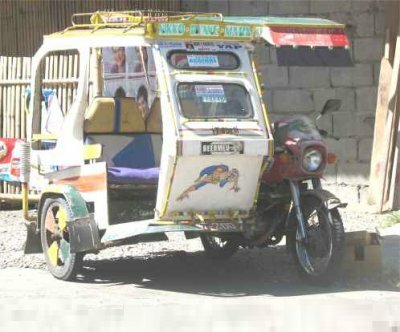 A motorela in Cagayan de Oro. 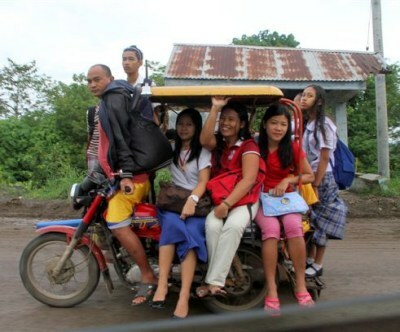 Habal-habal is an indigenous means of transportation usually used in far-flung barangays where jeepneys and tricycles cannot stand the rough, steep terrain and narrow roads. 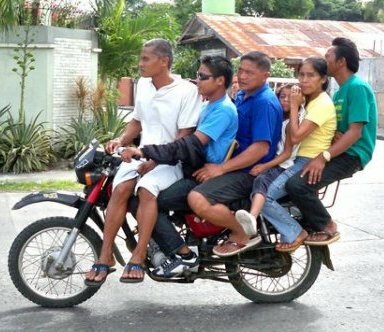 The habal-habal comes in two forms: one is motorcycle with an extended seat protruding over the back wheel that can accommodate up to five passengers, minus the driver. The second, more complex form of the habal-habal, also called “skylab,” can seat up to 13 persons, including their baggage. It has extensions consisting of wooden planks placed across the back seat of the motorcycle to form the seats for the passengers. CAUTION: Both versions of the habal-habal are currently illegal in the Philippines. Passengers who are injured or even killed while riding the habal-habal cannot claim benefits because this industry is not covered by insurance. On December 5, 2013, Misamis Occidental Rep. Henry Oaminal filed the House Bill 2322, seeking to legalize the operation of habal-habal. WE RECOMMEND: You may use the "taxi" habal-habal, where the driver of the motorbike takes only one passenger. Ride only with a helmet!